This marked the final day of a nearly week-long Cascades volcano skiing trip (see prior reports for Mt St Helens, Shasta West Face, Lassen NE Face, Mt Scott, and Diamond Peak). Corey and I met at the Timberline parking lot early Sunday morning, after I had skipped out on the previous day's Diamond Peak trip in order to rest and spend a day taking photos of numerous Oregon volcanoes. Corey had skied the Wyeast Face a week earlier, and said it was in great shape, so I was eager to try it. We skinned up from the parking lot after 7 am, following the climber's track along the east side of the ski area. 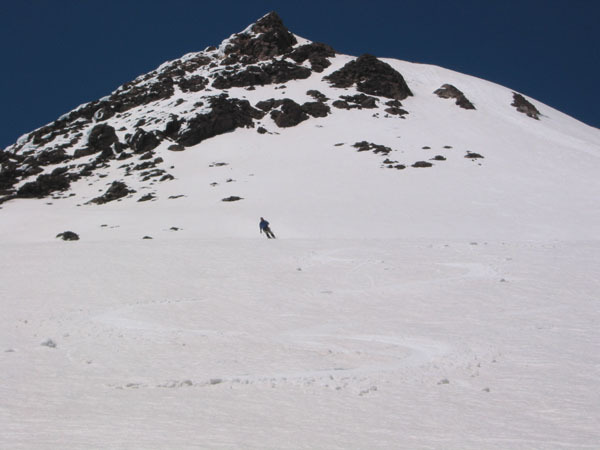 The previous week's heat wave had reduced the snowpack substantially, making access to the Wyeast Face from Timberline more difficult, as most of the moraines beside the White River Glacier had begun to melt free of snow. A cooling trend had now begun, with moderating temperatures and a strong NW wind, which was raising a huge and vile dust storm from the lower part of the White River drainage. We crossed a single moraine on foot near 7700 ft as wind-driven ash sandblasted us, and then skied east across the White River Glacier to the base of a prominent snow gully, losing about 200 ft elevation. A few crevasses are beginning to show on this part of the glacier, but nothing worrisome. We skinned up the snow finger which led directly to the lower Wyeast Face, and continued up to about 9500 ft, meeting the deep boot track coming up from Mt Hood Meadows. The skis went on the pack and we followed the staircase to the top of the face at 10700 ft by 1 pm, huddling beside the fumaroles below the ridge to escape the 30-40 mph gusts from the NW. The ridge traverse above Steel Cliffs which leads to the summit was completely melted out now, so we made no effort to reach the top (Corey had climbed the ridge a week earlier). With the late hour and steep SE-facing slopes (the upper face reaches about 44 degrees), we expected some sluffing despite the cooling trend. We set off several sluffs up to 3-4 inches deep as we skied the steepest part of the face, but none were problematic. As the slope flattened to less than 40 degrees below 10200 ft, the snow became excellent and very stable corn, and we arced some fat GS turns for the next 1000 vft. Snow became heavier and dirtier down the snow gully onto the White River Glacier. We skinned back across the glacier and tried to skin up the steep somewhat-corniced slopes on the west side, but this was futile and resulted in a couple of major slips and slides. Eventually we booted up these steep slopes and then traversed across the moraines to the ski area. It was after closing time, so we got to enjoy some 1500 vft of freshly groomed cruisers back to the parking lot. All in all, it was a great way to end our South Cascades road trip. With the recent melt out, access to the Wyeast Face is probably easier now from Hood Meadows, although looking down from above there appeared to be a few bare spots even on that route. Corey skiing the perfect corn on the lower part of the Wyeast Face near 9000 ft. We skied through the gap between the two rightmost large rock outcroppings. The sluffs we set off on the steep upper face are visible at right. Ahh, so nice to think back on last week. It seems you have still been busy this week right Amar? After 4 days of mostly laziness except for work, I'm itching to go ski another peak. I'm out this weekend, but am totally free the next 3. I'll get in touch with y'all, I have some ideads, I'm sure you do too.